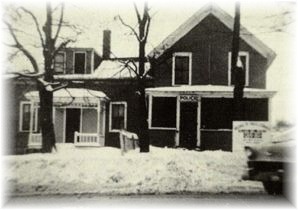 The Hales Corners Police Department traces its origins back to April 15th 1952 when the first Village Board meeting was convened. At this meeting both Sylvester Sweeney and Ralph Chatfield were appointed to the Public Safety Committee with Ralph Chatfield also being appointed as the Village Constable, the first law enforcement officer in the employ of the village. In November of 1953 Trustee Albert Mears introduced discussion on the possibility of a full time Police Department. The Milwaukee Police Department at this time offered its academy courses to the Village for training of any officers at no cost to the Village. In February of 1954 a 1954 Chevrolet was purchased by bid from Holz Chevrolet as the first Hales Corners Squad car for use by Constable Chatfield who had previously been utilizing his own vehicle. In April of 1954 Trustee Sylvester Sweeney once again brought up discussion of a full time police department. Village Attorney David Schoetz advised of the need of a police commission being set up if a department was organized. In May of 1954 the position of Village constable was abolished but it would not be until March of 1955 that Ralph Chatfield would relinquish the position and turns all his equipment over to the Hales Corners Police Department’s first Chief of Police. In December of 1954 applications for the position of Chief of Police were obtained and made available to applicants. Three applicants were subsequently selected for interviews from a field of six who applied. These gentlemen were David P. Geary, Richard A. Schoenborn and Alvin H. Peterson. On February 21, 1955 interviews were conducted and David P. Geary was recommended for appointment as the first Chief of Police of the Hales Corners Police Department. On March 7th, 1955 the duties of the Village Marshall were officially transferred from the constable to the Chief of Police and the Hales Corners Police Department came into official existence. 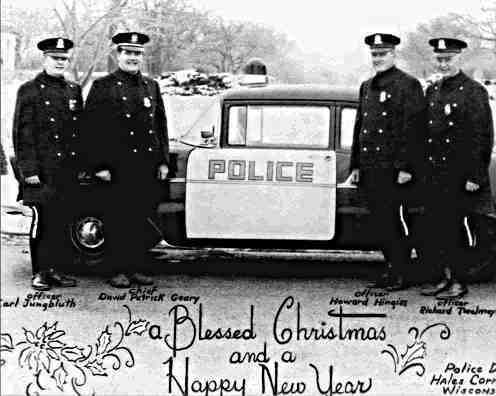 In April of 1955 Chief Geary recommended that two additional officers be hired and in November of that year officers Carl H. Jungbluth and Richard A.Twelmeyer were hired as the Village’s first police officers. In the sixty-two years that have passed since Chief Geary’s appointment eight other Chiefs have followed in his footsteps in leading the Hales Corners Police Department. In order of succession they were: Michael Wolke, Harold Phalen, Carl H. Jungbluth, DuWayne A. Dzibinski, Michael J. Krahn, Richard A, Manske, Kent R. Bieganski, and Eric R. Cera. The “permanant” officers that served with them over these years, providing for the safety and security of the Village’s residents can be found on the roster of officers which follows.